Federal Government of Pakistan has initiated "Prime Minister's Youth Skill Development Program" to alleviate poverty, provide skilled workforce to industry, enhance employment opportunities and to meet international labor market needs. Under this program, total 25,000 unemployed youth (belonging from lower and middle class families) will be provided Skill Development Training in 100 demand driven trades. The program is being executed by National Vocational and Technical Training Commission (NAVTTC), Government of Pakistan. The duration of Programs is 4 to 6 months (including 1 month On-Job-Training). The selected trainees will be given monthly stipend of Rs. 2,000/- (Rs. 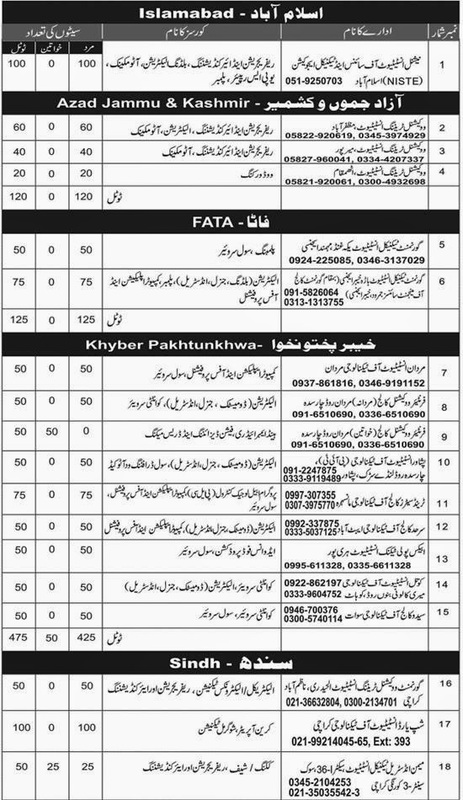 3,000 for FATA Trainees). In few trades free Tool-Kits will also be provided. The training will be provided in 350 public and private sector Technical and Vocational Training Institutes, across the country. Training will be provided in different fields e.g. Dress Making, Embroidery, Fashion Designing, Beautician, Welding, Auto-CAD, Solar, Poultry, Ceramics, Quantity Surveyor, Cooking, Chef, Agriculture, Live Stock, Auto Engineering, IT, Telecom, Electrician, Refrigeration, Air-conditioning, Wood-working, Plumbing, Civil Surveyor, Computer, Services, Heavy Machinery Operator etc. 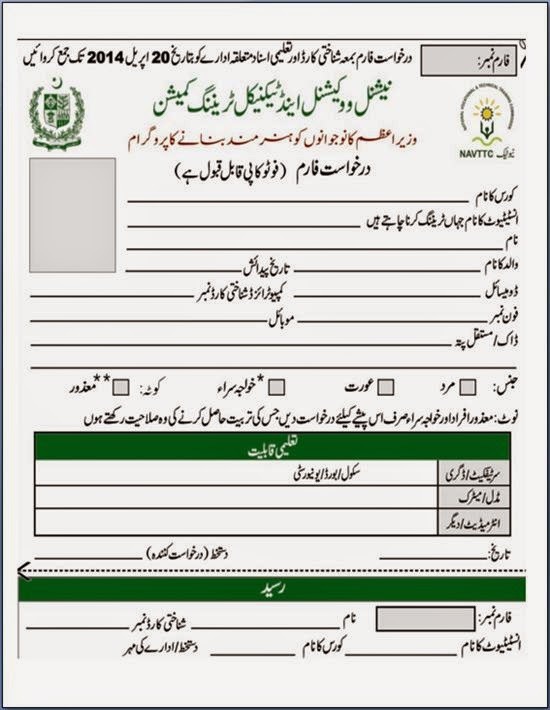 All young men/women, Pakistani citizens with a valid CNIC between age 18 – 35 years. 15-03-2015 is the last date of application submission. Classes will be started from 24-03-2015. A monthly stipend of Rs.2,000 (Rs.3,000 for FATA trainees) for six months would be paid to each beneficiary of the scheme. 3052 number of trainees will be trained in this first phase. Total 25,000(estimated) people will be trained under this program. 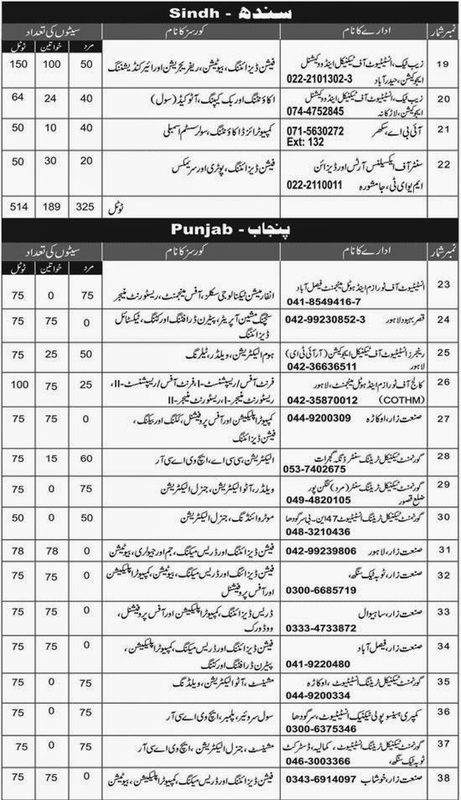 Any Pakistani citizen who meet basic criteria, may submit duly filled applications with attested photocopies of educational certificates, domicile, CNIC and 02 passport size photographs in your nearest institute from the list given below below 15 March 2015. 10 percent quota for special/ disabled persons. 05 percent quota for minorities. For information and inquiries, call Toll Free Number 0800-77000. 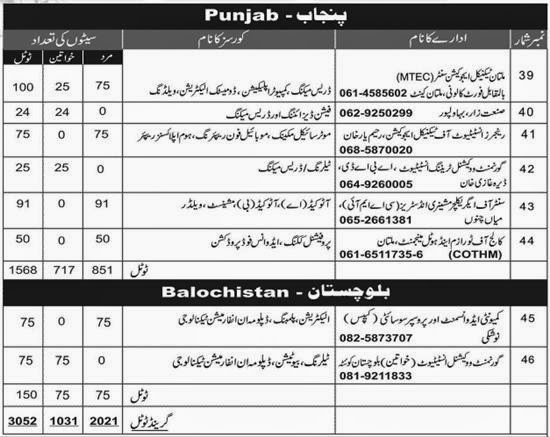 Courses are being offered in various technical and vocational institutes of Punjab, Sindh, KPK, AJK, Balochistan, Islamabad and FATA.